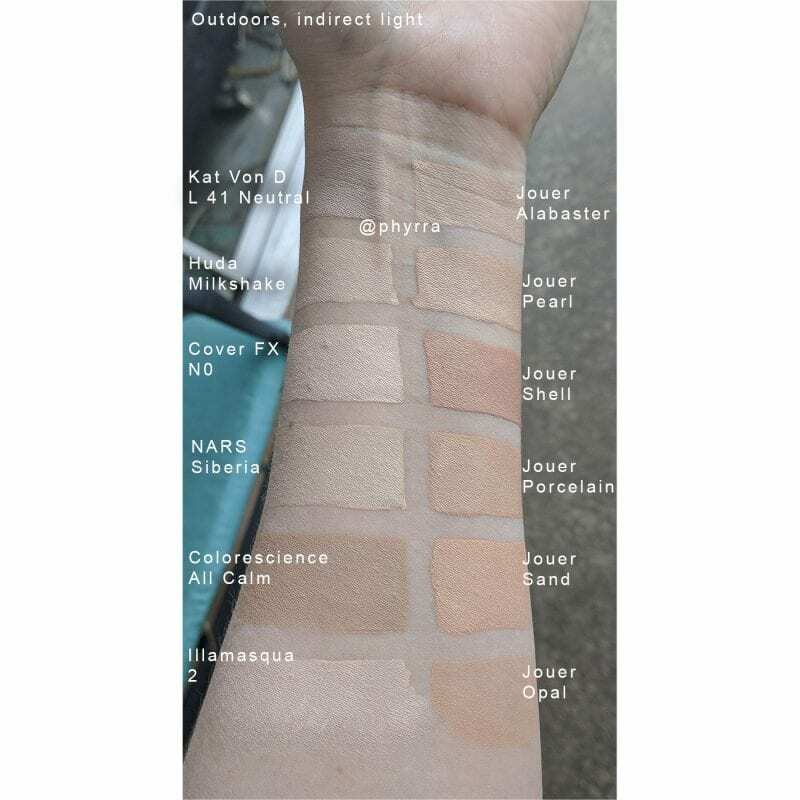 I wanted to share my Jouer Essential High Coverage Creme Foundation swatches with you. I bought the shade Pearl, which is too dark on its own for me. 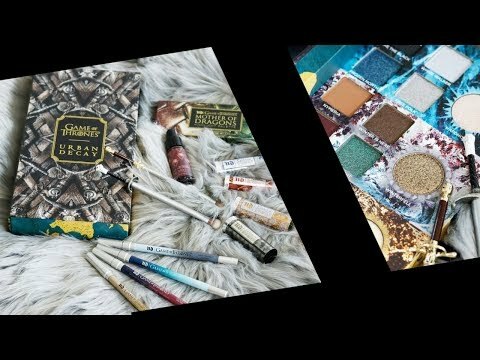 I swatched the Fair pack that came with it. I also had Jouer Luminizing Moisture Tint in Opal that I included next to some of my other foundations. 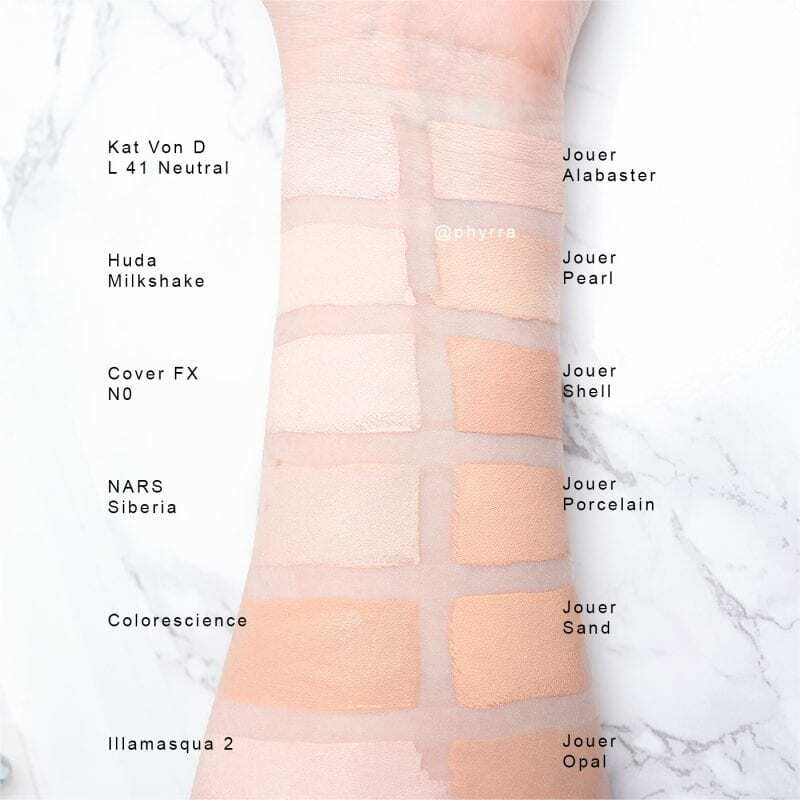 All foundations are cruelty free except for NARS. Jouer Cosmetics is cruelty free and Leaping Bunny Certified. Please note, my arms are darker than the rest of me right now. I’ve been spending 1 to 2 hours outside daily with my new puppy Nyx. I match my foundation to my neck and my chest, not my face. My face appears darker and redder than my neck and chest. 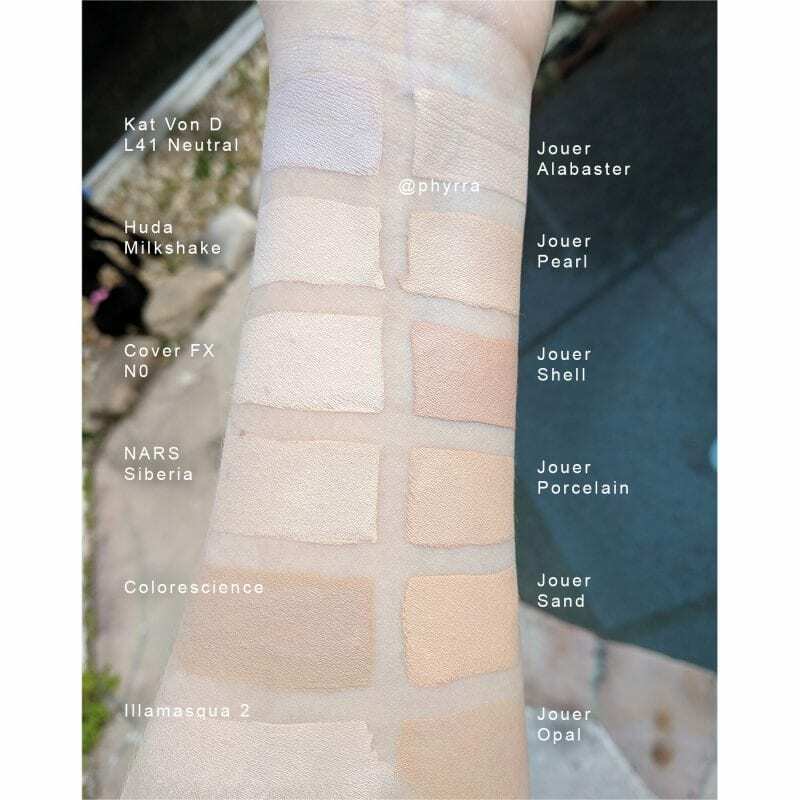 Pale neutral shades work best for me. Pink shades make me look sunburnt. I have a lot of surface redness. I love Kat Von D Lock-It’s color but the formula is more suited for oily skin than my dry skin. I can’t comfortably wear it. I hope that Kat will release a formula for dry skin! Huda Beauty’s FauxFilter foundation works surprisingly well on my dry skin! See my review. I’m disappointed that Jouer Essential High Coverage Creme Foundation in Pearl is too dark for me, as I predicted. I don’t want to have to add white to my foundation to make it a match for my skintone. I don’t think that Alabaster would have worked either. It looks like it leans pink in my swatch. I wish brands would take a lesson from Kat Von D, Fenty or Huda when it comes to foundation range. Not everyone fits into the 20 shades of beige that most brands seem to offer. I do have to say that the Jouer Essential Precision Foundation Brush is amazing! The teardrop shape does a great job getting around the eyes, nose, and brows. 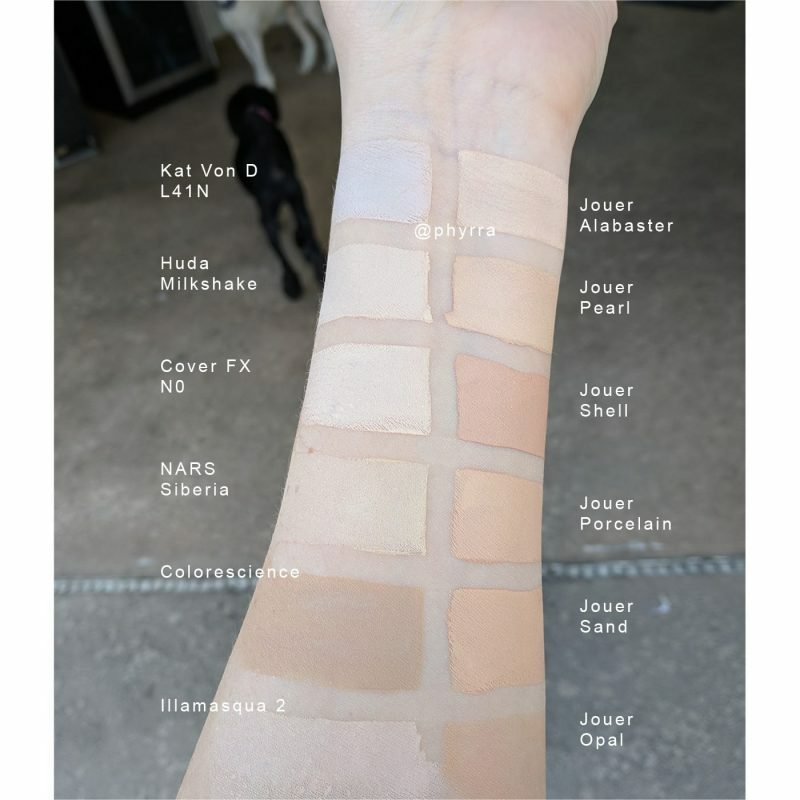 I’ve used it with the Jouer Essential High Coverage Creme Foundation and the Idun Minerals Norrsken Foundation with great success. What’s your current favorite cruelty free foundation? Previous articleIs Kate Somerville Cruelty Free? Do you have an opinion of the foundation? Does it have fragrance? I think I could wear Alabaster.